Grab my short story collection for free over the next five days! Gators, ghosts, a haunted house, love, loss and college boys playing “hide the dragon” are all found in this collection of short fiction by Stephen del Mar, and features the shared setting of Bennett Bay and Big Cypress County. In “The Three of Us“, Sammy, Reed and Jeff have a very intense first week of college. They deal with teen angst, falling in love, and discovering that when it comes to family, there are no boundaries. In “The Broken Heart“, Zach retires to Florida to restore an old boat and get over his dead lover. He is done with love. Or so he thought. With the help of a ghost and a touch of vodou, will he be open to new possibilities? If you rob a bank, it’s probably best if you don’t do it in the middle of a hurricane. And on the run after robbing said bank, you might want to reconsider hiding out in the most haunted house in the county. “The Demise of Bobby and Clyde” doesn’t have a happy ending, but there is a lot of ever after. Grieving takes time, yet there is that moment when we turn the corner toward “moving on.” “The Envelope” is a short and intense story about the moment Tony realizes how much his partner, Lance, loved him. And what he needs to do to say goodbye. 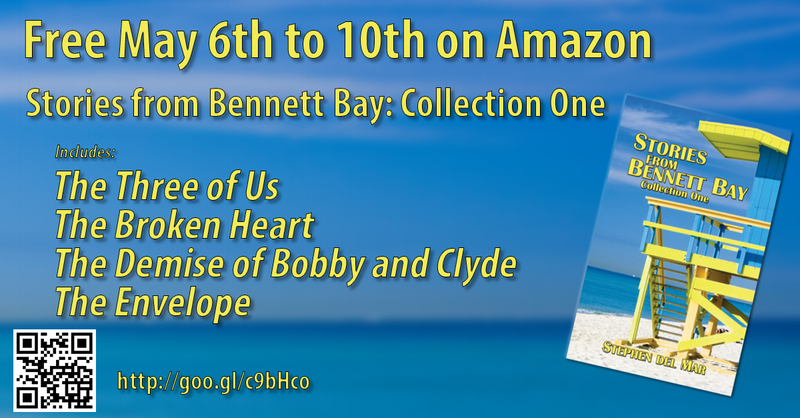 Kindle Countdown Deal: Stories from Bennett Bay, Collection One. This week only! Short Story Collection Free for Halloween!